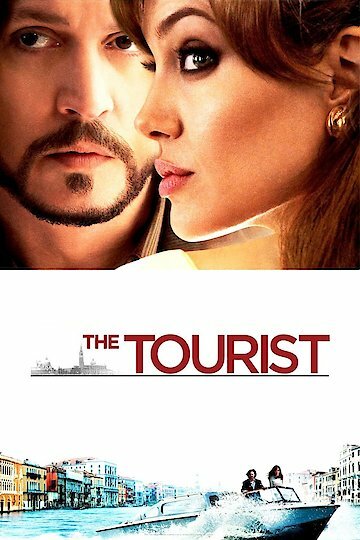 "It all started when he met a woman"
The Tourist is an action adventure spy movie starring Angelina Jolie and Johnny Depp. Angelina Jolie plays an international socialite who also happens to be part of Scotland Yard. The story starts out in France where Elise, played by Angelina, is being watched by policemen. While sitting at an outdoor cafe, she receives a note from a messenger, which she burns before leaving the table. The note is from her former lover who is wanted by a number of government authorities. The note instructs her to board a specific train and look for a person with roughly the same build and height as her ex. On the train she chooses to sit with a man claiming to be an American math teacher named Frank. Frank is played by Johnny Depp and seems to appear and disappear at the strangest times. He ends up spending the night in Elise's hotel suite, where she receives a bouquet of flowers from her former lover with new instructions on where to meet him. Her former lover is Alexander Pierce, a man who took a large sum of money from his ex-partner. His partner wants the money back so he also has Elise watched by his own thugs. The story moves from France to Italy, where Elise ends up rescuing Frank from the thugs who believe he is the man they are looking for. The story has plenty of action, with car and boat chases along with some mystery. The elusive Alexander Pierce never seems to show up at the appointed meeting places he sends Elise to. Instead, Frank shows up as an unsuspecting character who seems to be quite adept at getting out of trouble. In the end, Alexander's old partner has captured Elise in the hopes of flushing Alexander out of hiding. He threatens to kill her if she cannot open the safe where he believes the money is stored. The Tourist is currently available to watch and stream, download, buy on demand at Amazon Prime, Starz, Amazon, Vudu, Google Play, FandangoNow, iTunes, YouTube VOD online. Superstar couple Angelina Jolie and Brad Pitt once again shared their blessings last Christmas by donating $2 million dollars to Naankuse Lodge and Wildlife Sanctuary in Namibia. The money was donated in the name of the couple�s daughter Shiloh through the Jolie-Pitt Foundation. Angelina Jolie gave birth to Shiloh in 2006 at Swakopmund, Namibia. � The Tourist actress and Academy award winner Jolie said, "We want her to be very involved and grow up with the understanding of her country of birth.